Welcome to my world, there’s only one direction you can move so let’s shuffle along to the end of the whole mess. I find noir fascinating. There’s something painful and insane about watching someone slowly stitch themselves up in their own body bag through their actions and choices. That inevitable dread we all feel but society says we should ignore. The knowledge it all ends. It’s perfect narrative fuel. And don’t get me wrong, I love other stuff. I do. Pixar have nearly paid out their mortgage in my brain, and you can’t get much further from noir than them. I dig old dumb action flicks, or sometimes I just want to laugh. I’d wager there isn’t a genre out there I don’t have some respect for a huge work in it. But much like our children, or our wives, we all have a favourite. Mine just happens to be the one that kicks me hardest in my guts. 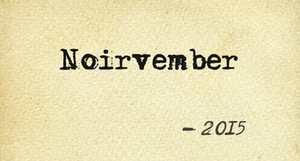 You see, for me, and for my month, ‘noir’ means the perfect downward spiral for your lead character. I dig film noir, but that’s an aesthetic thing, I’m talking under the hood of the story engine we see the fuse has been lit the whole time and you can drive where you want, do anything with your final moments, but you will be facing forward as the final moment obliterates you. And it’s most likely been your fault all along. This makes me feel better about focusing on my own noir, because I guess there might be shades of black, right? Maybe now you see why I like noir. Keeping company with the worst people known, watching them fail, hell, making them fail. There’s more to playing god at the keyboard than just letting the characters find themselves. Sometimes you sharpen the punji sticks in the trap, piss all over them, and then lead a breadcrumb trail right across the top. Fun. I believe writing is therapy and I guess by peering into my darkest places I find myself and hope to liberate something. I am certain over the coming 29 days you will see my turgid soul laid bare. May you poke and prod it until it rises up to consume you before combusting under the weight of its own drama. Noir: making me feel better about myself since 1982. What a great genre to sink our teeth into. Almost as good as Vamptember. Can’t wait to read about my two favourite noir classics. The Big Sleep and The Pessimist. I’m in. Looking forward to the failures. Of the subjects and not the author obviously.